Do-it-yourself (DIY) furniture painting may seem simple enough, especially if you are repainting your bedroom walls or kitchen cabinets, but there are many things that can and do go wrong. The right tools, technique, and preparation are just a few key things needed, even for a DIY project. But many homeowners often forget essential factors like these and dive right into a project, only to realize why they should have called the professionals. Before taking your furniture painting project upon yourself, here are some of the common errors with DIY painting you should look out for. They may even inspire you to hire a painting company in Toronto! We’ve all fallen victim to the “expectation vs. reality” notion. You have this great idea in mind—maybe inspired by a photo you saw on Pinterest—but when you put your plan in action, you are disappointed. 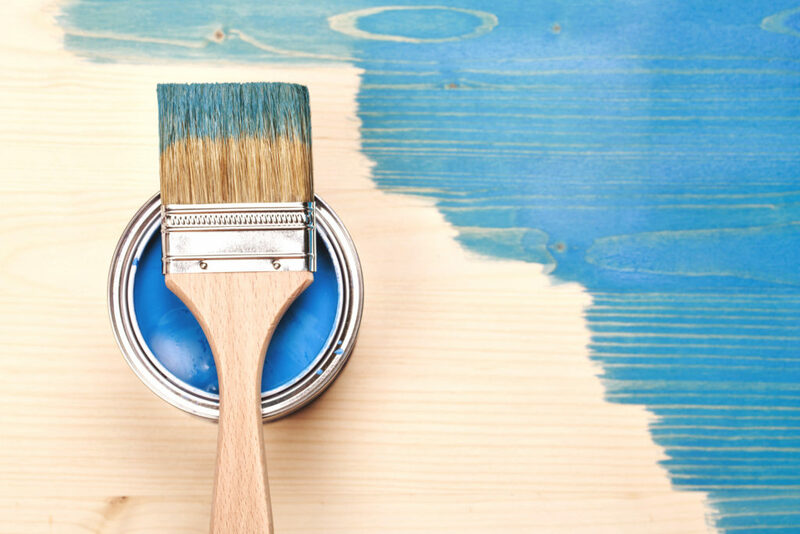 Repainting your walls or cabinets will make them look beautiful and vibrant again, but if they are worn and have visible imperfections, a DIY job will not cut it. These grooves will show through the paint if you do not carefully sand and smooth them out or fill them in. Some things are better left to experienced hands. When you hire professional cabinet painters, they will have the right tools and know-how to make your cabinets look brand new. Forgetting to plan and prepare is one of the biggest reasons why people choose to hire professional painters instead of doing it themselves. Homeowners often want to jump right into a project, but do not always dedicate the time to planning the process. Painting is more than slapping a new coat on the walls or cabinets, it requires careful prep work, cleaning, sanding down uneven surfaces, filling cracks, lining areas with painter’s tape, covering furniture and floors, and patching damaged areas and nail holes. There is a lot involved in the painting process, so forgetting to plan ahead will not help you. A key step people forget when DIY painting is to sand their wooden furniture before painting. This is one of the most important steps, even if it is laminated faux wood. Sanding gives the furniture a smooth, bare surface that the primer or paint can adhere to easily. It can also remove deeply embedded dirt and oils that you would not want to have under fresh paint. Sanding minimizes the risk of drips, runs, and stroke marks from previous paint jobs, so your final result is fresh and clean. Sanding also softens sharp edges, removes minor imperfections, and ensures a better-quality look. Cleaning prior to painting is an essential step many homeowners skip. You may not see it but dirt, oil, and dust accumulate on your walls and cabinets, just as they do on any other surface. Without thoroughly cleaning the surfaces, the paint will have a difficult time adhering and oil or grease that is not fully removed may stain through the primer & paint. Primer is one step many people dismiss when doing a DIY painting project. However, it is one of the most important steps as it allows the paint to stick better to the surfaces. Primer also makes your paint job last longer, so if you think it is not worth your time, you may want to reconsider! Painting isn’t a simple, lazy project you can finish on a Sunday afternoon; it can take up your whole week! If you do not set aside enough time, you may have to leave your project half-done for a few days, which will ruin the uniform look of your project in the end. Professional painters are able to dedicate the time to get the job done for you without disrupting your daily routine. Forgetting to protect your floors and furniture is a big mistake. Even if you’re careful, paint can still drip or accidentally end up on surfaces you don’t want them on. Cleaning paint off floors or furniture can be very time consuming. As annoying as it may be, carefully wrapping your furniture in plastic and lining your floors with paper or drop cloths is vital to ensuring you do not damage your property. Like protecting your floors and furniture, using painter’s tape to line the areas you want your paint to go is time consuming. However, it must be done for a tidy and professional-looking job. This is the main way to get clean, sharp lines as you paint, and it prevents any bleeding paint from reaching your floorboards or windows. Believe it or not, doing a quality paint job can be hindered with the wrong weather conditions. Trying to paint cabinets in cooler temperatures can cause your paint to harden before it is properly applied. Hot, humid temperatures can make paint drying a lengthy, frustrating process. When professionals handle your painting, they will ensure your home is the right condition for painting, or, they will remove your cabinet doors and drawers and get the job done at their facility where conditions are perfect. Using a brush or roller might be acceptable for minor projects or easy, flat surfaces like walls, but when repainting wooden cabinets, these tools don’t cut it. That’s why professional painting companies use spray guns and equipment to give the surface a much smoother finish. No nooks or crannies will be left unpainted with this technique and it eliminates the risk of visible brush strokes or uneven paint distribution. If you want to give your home a fantastic new look without the steep price tag, repainting your cabinets and walls is a great option! At Booth7, our customers consider us their one-stop shop to giving their home a fresh new style without going over their budget. We provide our customers with high-quality, professional painting and refinishing services and pride ourselves on our excellent customer service. We will clean, sand, prime, and paint your cabinets for you, carefully removing doors and handles to ensure we do the best work. Worried about lingering paint smells in your home? Don’t be. We only use water-based paints and solvents, so our customers don’t need to plug their nose in fear of breathing in harmful chemicals. We handle all the details of your kitchen refinishing project from start to finish, so you can trust us to get the job done right! To get started, fill out our online form or contact us at info@booth7.com. Our staff with respond to your inquiry within a few hours. If you know the way you want your cabinets or walls to look, send us a photo of your existing area and get a free consultation and estimate today! Copyright © 2019, BOOTH7. All Rights Reserved.